This Monday, the NEA honors Gary Burton, Wendy Oxenhorn, Pharoah Sanders, and Archie Shepp. Watch the live stream online! Or consider the standby line for unclaimed tickets. The National Endowment for the Arts Jazz Masters award is the highest honor that our nation bestows on living legend jazz musicians in recognition of their lifetime achievements and exceptional contributions to the advancement of jazz. 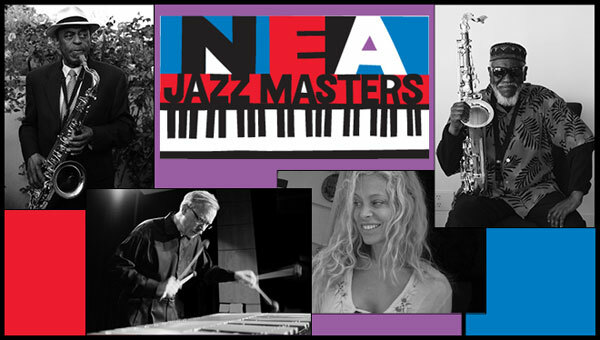 The NEA will honor the 2016 NEA Jazz Masters –Gary Burton, Wendy Oxenhorn, Pharoah Sanders, and Archie Shepp in a free concert hosted by Jason Moran, with performances by NEA Jazz Masters Chick Corea, Randy Weston and Jimmy Heath, as well as Billy Harper, Stefon Harris, Pedrito Martinez, David Murray, Karriem Riggins, and Catherine Russell. Watch the live stream here at 8 p.m. Monday. NOTE: Although all free tickets for this concert are reserved at this time, unclaimed tickets will be released and distributed to a stand-by line at 7:45 p.m. on April 4 at the Hall of Nations Box Office.